In 2002, the primordial reason for which I created this website was related to a wave of Hmong teenagers' suicides in Fresno County (considered as having the highest rate of teen suicides in the United States at that time). I felt immensely powerless as a Hmong woman and researcher from France working at the University of California-San Francisco in the Southeast Asian Health Center when these suicides of adolescents and young adults occured. At the personal level too, I wanted to do something to help the Hmong young generations who experienced deep and sorrowful crises due surely to their cultural identity confusion and apparent irreconcilable gaps while living in two worlds so different, the Hmong community versus the American Mainstream society. I wanted to culturally bridge them to their heritage. So I wrote about the Hmong issues to offer them a positive representation of their rich history, culture, language, literature, arts, ... , and to enhance their understanding so that they appreciate their historical and cultural heritage. I also wanted to leave a message: "Difficult topics are talk-able". And they should talk about using different approaches like academic studies, fictions, ... . So I wrote about sensitive topics such as the bride pride from various perspectives: fictional, ethnographical, critical, ...., academic. I included indigenous views and brought in the discrepancies or inadequate, or even appalling, impacts on the Hmong's daily life. "Trees have roots to grow and bloom, human beings need history, culture, symbols to root themselves in order to grow into maturity and flourish", a thought that I often have in mind, which makes me conceive my website as a "generativist tree" with many roots and branches as hypertext links. Because my target population was the Hmong young generation, I designed my website as a village with lots of flesh colors, filled with plenty of knowledge to take. I posted my poems, especially the ones I wrote as a young adult to connect with my young audience. I wrote in 3 languages (Hmong, French and English) so that all could read and understand wherever they live. Without any skills to design a website, I slowly learned to build mine at geocities.com -- I chose this platform because it was cheap and easy for me. Even if my English (my 4th language) was not enough sophisticated, I kept writing in hoping that some of the readers might be able to connect to some of my ideas. (Raised in France, having learned French since my childhood in Laos, French of course remains my intellectual language). Managing a trilingual website, writing about Hmong issues in using different formats, fiction, academic research, journalistic report,..., and trying to make the topics relevant while paying attention to the reliability of the sources, were not easy. One thing leading to another, I found myself writing short-stories, social fictions in addition to poems, research papers, journalistic accounts, ... .
As I mainly devoted my time to conduct academic research, such a creative work, out of my area of expertise, was unexpected. Really, this site has broadened my horizon and revealed opportunities that I could not even imagine. By writing with commitment and sincerity without seeking fame and richnesses, one can change, if not the world, surely lots of minds and hearts. Effectively, during my active years, I had received hundreds of emails where readers could relate to my fictional characters: "Toua of the 3rd Beauty", "Ann PajYeeb of the Wedding Dilemma", "Malia of the 3 Pearls Facing Unfaithfulness", etc. My characters had entered people's imagination, and lived beyond my website. I was really touched by all these emails of encouragement! From 2009 to 2017, I stopped writing, and did not take much care of my website. But I did realize that this website Hmong Contemporary Issues had some fans. I discovered that some good souls archived my website out of charge, which has allowed people to continue enjoying my work over the years. From time to time, people reminded me of the usefulness of such a small website. It has some voices that count. Truely, I would like to take this opportunity to thank all the people, unknown and well-known, who generously contributed to preserve it -- by asking my permission to host it, or sometimes by archiving it without my knowledge, and for many by acknowledging my work in their respective websites. Starting summer 2018, I decided to revive my website at this address "hmongcontemporaryissues.com". (I am still very ignorant on how to build a website. So if you have time to help me, to write for my website, or to donate for the maintenance of this website, feel free to let me know at [email protected] . The 2018 design of my website won't change too much because I would like to have a continuity in color, spirit, sincerity, voice, ... , but I won't put the 3 languages together: each page will have the content in only one language. I will continue to share my analysis and understanding of the Hmong issues through essays, fictions, poems, ..., and still in three languages (Hmong, French and English)! I wish this website be a window widely opened to the Hmong issues where one can learn to appreciate and enjoy the Hmong culture, history, literature and arts. The Hmong people have a Millennial history where they experienced several waves of migration, firstly inside China before reaching its pic in the 19th century where a fraction left China for Southeast Asia during the Miao Rebellion [1854-1873]. In 1975, after the end of the Vietnam War [1961-1975], the Hmong, allies of the Americans in their Secret War in Laos, fled to Thailand before departing to the West, in the Americas (United States, Canada, Argentina, French Guiana), in France, in Oceania (Australia, New Zeland). Presented as a panoramic view, I wish to share my analyses on the various experiences of the Hmong people. In a critical approach, I will address the Hmong perspectives on history, the sociopolitical issues, the uses of language, the literary creativities, the religious and sociocultural changes, and other fields of knowledge. It is important to understand one's culture, and to reconnect with the collective memory made of sufferings and joys from past to present time. Such an understanding and appreciation will boost the well-being of the members, and also the cultural and economic development of the Hmong community. In combining both academic and educational approach to write, I hope this website, with its humanistic approach, will contribute to reinforce the historical awareness and cultural identity of the future generations so that they can access to a in-depth understanding of the challenges that await them and they will find the moral strenght to overcome the stakes for the growth of their community. In writing in three languages, I also hope to increase more awareness among the various Hmong communities in Asia and in the Diaspora of the importance to recognize the cultural diversity as the foundation of the Hmong identity. Each fraction being immerged in a particular country has gained in culture and language diversity. I deeply wish that my effort to write for this website will continue to have an impact on older and younger generations, born in the West, to establish a healthy and enriching dialog with themselves and their culture, to find the way back home to their community and identity newly recomposed by each piece of their new experiences in contact with their respective Mainstream society where they now live. Their appreciation and love of the Hmong people, their culture, literature, arts will take them to a life where they can peaceful cultivate their secret garden. Being a Hmong in our time is undeniably an asset, a chance, and a richness! 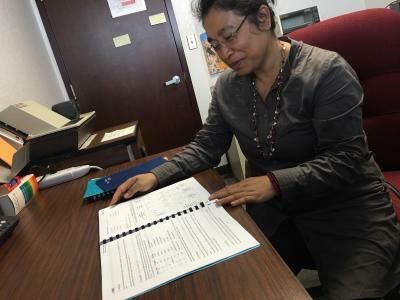 To promote the new Hmong Minor at Fresno State, Kao-Ly proudly showed her Hmong Language textbooks given to students --at the photocopy cost only -- to Ezra Romero, Valley Public Radio host, 2016. 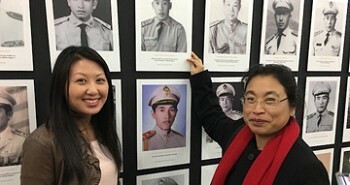 Dr. Kao-Ly Yang (right) touched the photo of her father at the HmongStory 40 art exhibit, Dec 2015. Young woman, fiercely in love with travels, Kao-Ly Yang enjoyed watching the Village of Ash, while sitting down at the gate of the Village Hav Tab Seeb, known as General Vang Pao's Village, Laos, 1994.